In a variety of critical situations, multiple harmful factors such as endotoxins and some proinflammatory cytokines can initiate a series of inflammatory responses, which may injure endothelial cells (ECs). Endothelium damage has been found to play an important role in the development of multiple organ failure (1, 2). Thus, protection and/or regeneration of endothelia have been considered as an important therapeutic strategy for multiple illnesses including sepsis (3, 4). Abundant studies have demonstrated that endothelial progenitor cells (EPCs), a population of cells mainly derived from bone marrow, contributing to neovascularization, vascular maintenance and repair (5). Thus, EPCs may exert a beneficial effect on clinical outcome of sepsis. Indeed, several clinical trials have revealed that patients with an increased number of EPCs in peripheral blood had a higher survival rate in sepsis (6) and acute lung injury (7). As the origin of EPCs, bone marrow has been found to support the proliferation of stem/progenitor cells, a salient finding is the microenvironment termed “niche”, in which stem/ progenitor cells reside and proliferate (8, 9). Recently, osteoblasts have been verified to support the construction of “niche” (8, 10, 11), and were found to secrete stromal cell-derived factor-1 (SDF-1) (12), a powerful chemoattractant mediating the mobilization of stem/progenitor cells. Fibroblast growth factor receptor 1 (FGFR1) is one of a family of four membrane-bound receptor tyrosine kinases (FGFR1-4). FGFR1 plays important roles in bone development and metabolism. Mice lacking Fgfr1 in differentiated osteoblasts showed increased bone mass, and deficiency of Fgfr1 in osteogenic progenitor cells led to increased osteoblast proliferation (13). Our previous study revealed that mice with osteoblast-specific deletion of Fgfr1 (Fgfr1fl/fl;OC-Cre) exhibited increased bone mass and osteoblast numbers (Supplementary Material: Fig. S1). As osteoblasts can promote proliferation and mobilization of stem/progenitor cells (11, 12, 14), we suspected that FGFR1 may affect the mobilization of EPCs via its effects on osteoblasts. In this study, we used endotoxemia mice model to study the role of osteoblast FGFR1 in the mobilization of EPCs. Mice that were homozygous for the floxed Fgfr1 allele (Fgfr1fl/fl) (15) were bred with transgenic mice in which osteocalcin (OC) promoter drives Cre recombinase expression in mature osteoblasts (OC-Cre) (16) to generate Fgfr1fl/fl;OC-Cre mice. Male eight-to-ten-week-old Fgfr1fl/fl;OC-Cre mice were used for experiment, their littermates, male Fgfr1fl/fl mice were used as controls. All animal experiments were approved by Animal Care Committee of Third Military Medical University. The endotoxemia model was made by a peritoneal injection of LPS (10mg/kg) in mice (17, 18). Peripheral blood and serum were harvested at 12 hours (h), 24h, 48h, 72h and 1week (w) after LPS injection. The mice without LPS treatment were as control (0h). We used CD34 and vascular endothelial growth factor receptor 2 (VEGFR2) as the markers of EPCs and counted EPCs numbers in peripheral blood mononuclear cells (PBMCs) by fluorescence-activated cell sorting (FACS) analysis (19-21). In brief, PBMCs were harvested by gradient centrifugation using Ficoll-Hypaque (Amersham Biosciences, Freiburg, Germany), then incubated with FITC-conjugated anti-mouse CD34 (eBioscience, San Diego, CA, USA) and PE-conjugated anti-mouse VEGFR-2 (eBioscience, San Diego, CA, USA) at 4℃ for 30 minutes. Appropriate fluorochrome-conjugated isotype controls were used for each staining procedure. After appropriate gating, the percentage of CD34/VEGFR-2 double-positive cells in PBMCs was quantified by flow cytometry (Becton Dickinson, Mountain View, CA, USA). Previous studies demonstrated an elevated osteoclast activity could enhance stem/progenitor cell migration (17, 22), in this study we analyzed osteoclast activity by measuring serum tartrate-resistant acid phosphatase 5b (TRAP5b) and histologic analysis. Serum TRAP5b was measured by ELISA assay (Immunodiagnostic Systems, Boldon, UK) with a detection range from 0 to 10 U/L. For histologic analysis, left tibiae were fixed in 4% paraformaldehyde overnight at 4°C, rinsed with PBS and decalcified in 15% EDTA (pH 7.4) for 20-30 days before being embeded in paraffin. Six-micron-thick sections were stained for osteoclasts using TRAP kit (Sigma Aldrich, St. Louis, MO, USA) (23). Spot software was used to quantify the osteoclast number per field. Osteoblasts were isolated and cultured as previously described (24). Briefly, calvaria were isolated from neonates at 3-5 days, and digested twice with 0.1% collagenase/0.05% trypsin at 37°C with 5% CO2 for 20min. The first two digested cells were discarded, and the 3rd digestion with the same condition was performed for 4 h, followed by centrifuging at 1,500 rpm for 5min. The supernate was then removed and the pellet was resuspended in 5ml of medium containing 10% FBS. Ninety five percent of these cells were osteoblasts or osteoblast precursors (25). Passage 1 osteoblasts were used for all studies. For osteoblastic differentiation assay, primary cells were seeded at 8×104 cells/well in 24-multiwell plates. After confluence, the medium was supplemented with 50 µg/ml ascorbic acid, 10mM β-glycerophosphate and 10-8 M dexamethasone (all from Sigma Aldrich) and replaced every 3 days. After cultured for 7 days, cells were treated with LPS (1ng/ml or 10ng/ml). Media were harvested at 0 h, 8h 12h, 4h, 48h and 72h after LPS treatment and stored at -80°C before analyzing. Serum samples were isolated from peripheral blood and stored at -80°C before measurement. Previous studies demonstrated the role of SDF-1α in chemotaxis of stem/progenitor cells (14, 26). In this study, we measured SDF-1α levels in serum and culture medium using enzyme linked immunosorbent assay (ELISA) (R&D Systems, Minneapolis, MN, USA) with a detection range of 14 to 69 pg/ml. Total RNA of osteoblasts was extracted using TRIZOl solution (Invitrogen, Carlsbad, CA, USA) according to manufacturer's instruction. RNA quantity was determined by spectrophotometer at OD260 nm. cDNA were prepared using the PrimeScript RT-PCR kit (Takara, Shiga, Japan). Q-PCR reactions were performed in a Mx3000P PCR machine (Stratagene, Santa Clara, CA, USA) according to previous study (23). Each run consisted of samples for genes of interest and Cyclophillin A (housekeeping control) (23) and was replicated three times. Sequences of the forward and reverse primers of mouse SDF-1α were 5'-GCTCTGCATCAGTGACGGTA-3' and 5'-TAATTTCGGGTCAATGCACA-3', respectively. EPCs were cultured according to the method previously described (27). In brief, after being isolated from mouse bone marrow, mononuclear cells (MNCs) were seeded onto fibronectin-coated 24-well plates (1×106/cm2) in Dulbecco's modified Eagle's medium (DMEM) (Thermo Scientific Hyclone, Logan, UT, USA ), containing 20% fetal-calf serum (Hyclone), basic fibroblast growth factor (bFGF, 5ng/ml) (PeproTech, Rocky Hill, NJ, USA), epidermal growth factor (EGF,10ng/ml) (PeproTech), vascular endothelial growth factor (VEGF, 50ng/ml) (PeproTech), penicillin and streptomycin (100U/ml) (Hyclone). Four days later, nonadherent cells were removed by washing with PBS, and the medium was changed every 3 days. After cultured for 7 days, EPCs were characterized to confirm the endothelial phenotype. Cells were incubated with Dil-LDL (Molecular Probes, Eugene, OR) at 37°C for 1h, followed by fixing with 2% PFA for 10 min after washing with PBS three times. Subsequently, cells were stained with a FITC labeled lectin from ulex europaeus agglutinin (UEA, Vector, Burlingame, CA, USA) for 1h. Cells with double labeled fluorescence were identified as EPCs. Negative control was made by incubating with PBS instead of Dil-LDL and FITC-lectin. Furthermore, flow cytometry (using CD34 and VEGFR2 as markers) was also used to identify cultured EPCs as method mentioned above. Chemotactic assay was performed according to previously described method (26). Chemotaxis of EPCs was assessed using a standard 48-well chemotaxis chamber (Neuro Probe, Gaithersburg, MD, USA) (26, 28). The DMEM (25μl) containing 1ng/ml, 10ng/ml and 100ng/ml SDF-1α (PeproTech, Rehovot, Israel) was added into each lower chamber. Cell suspensions (5×104/well) were reseeded in the upper chemotaxis chambers (5μM pore size; Corning-Costar). After 4 hours incubation at 37°C, the lower side of the filter was washed with PBS and fixed with 2% PFA, then the number of cells was counted after H&E staining. EPCs migrating into the lower chamber were counted within random high-powered fields. The experiments were repeated five times. Data were evaluated statistically in SPSS Windows, version 10.0. Results are shown as mean ± SD. Statistics were assessed using Student's t-test, assuming double-sided independent variance, and p values were considered significant at *p < 0.05, ** p < 0.01. After LPS injection, we isolated PBMCs and measured the percentage of EPCs at 0h, 12h, 24h, 48h, 72h and 1w. CD34/VEGFR2 double-positive cells are considered as EPCs (21). There was no significant difference between EPC percentage in Fgfr1fl/fl and Fgfr1fl/fl;OC-Cre PBMCs before LPS treatment (Fig. 1A, 0h). Several hours after LPS treatment, the percentages of EPCs in PBMCs of Fgfr1fl/fl and Fgfr1fl/fl;OC-Cre mice were both increased. EPC percentage in Fgfr1fl/fl mice reached its peak level at 72 h, however, the EPC percentage reached its peak level at 1 w in Fgfr1fl/fl;OC-Cre mice (Fig. 1A and B). All the percentages of EPCs in PBMCs of Fgfr1fl/fl;OC-Cre mice with endotoxemia were higher than those of Fgfr1fl/fl mice with endotoxemia at several time points examined (12h, 24h, 48h, 72h and 1w after LPS treatment). Elevated osteoclast activity can enhance stem/progenitor cell migration (17, 22), we also assessed osteoclast activity by TRAP staining of bone tissue (23) and measuring serum TRAP5b level (29, 30). TRAP staining showed that osteoclast number in Fgfr1fl/fl;OC-Cre mice was fewer than that in Fgfr1fl/fl mice before LPS treatment (Fig. 2A and B, 0h). After LPS treatment, osteoclast numbers in both of Fgfr1fl/fl and Fgfr1fl/fl;OC-Cre mice were both increased significantly. However, there was no remarkable difference between the osteoclast number in these Fgfr1fl/fl and Fgfr1fl/fl;OC-Cre mice after LPS injection (Fig. 2A and B, 48h). Serum TRAP5b is another marker reflecting osteoclast activity (31). Fgfr1fl/fl;OC-Cre mice showed lower serum TRAP5b level compared with Fgfr1fl/fl mice before LPS treatment (Fig. 2C, 0h). The serum TRAP 5b levels in both types of mice were significantly improved after LPS treatment for 12 h up to 1 w (Fig. 2C). However, after LPS injection, Fgfr1fl/fl and Fgfr1fl/fl;OC-Cre mice had a similar TRAP5b level in serum, which is consistent with the result of TRAP staining of tibiae. This result suggested that the higher blood EPCs number in Fgfr1fl/fl;OC-Cre mice with endotoxemia compared with that in Fgfr1fl/fl mice with endotoxemia may not be related to the changes in osteoclast activity that were observed after LPS treatment. Several studies suggested that SDF-1α is expressed by endothelial cells and that it plays an important rolein inducing cell egress under some stress situations (32-34). A previous study showed that an increased serum SDF-1α protein could initiate Sca-1+ and CD34+ cells mobilization (35). Therefore, we measured SDF-1α levels in serum of Fgfr1fl/fl and Fgfr1fl/fl;OC-Cre mice after LPS administration. Our data showed that the serum levels of SDF-1α were higher in Fgfr1fl/fl;OC-Cre mice than those in Fgfr1fl/fl mice from 12h to 1w after LPS injection (Fig. 3A). To observe if there is a SDF-1 gradient between serum and bone marrow, we also detected the SDF-1 level in bone marrow. We found that the SDF-1 level in serum was higher than that in bone marrow in Fgfr1fl/fl;OC-Cre mice (Supplementary Material: Fig. S2). Percentage of circulating EPCs in PBMCs is higher in LPS treated Fgfr1fl/fl;OC-Cre mice. (A) Flow cytometry analysis of CD34/VEGFR-2 double-positive cells in PBMCs from LPS treated Fgfr1fl/fl and Fgfr1fl/fl;OC-Cre mice for 0h, 12h, 24h, 48h and 1w. Both CD34 and VEGFR-2 are as the markers of EPCs. (B) Percentage of circulating EPCs in PBMCs at different time points after LPS treatment. There was no significant difference between the percentage of circulating EPC number in Fgfr1fl/fl and Fgfr1fl/fl;OC-Cre mice before LPS treating. Circulating EPC percentages in both types of mice were increased after LPS treatment for several hours. The EPC percentage in Fgfr1fl/fl;OC-Cre PBMCs was still higher than that in Fgfr1fl/fl PBMCs at all-time points. Graphs show mean value ± SD. (Student's t-test, *p <0.05, **p <0.01). There is no remarkable difference between osteoclast number and activity in septic Fgfr1fl/fl and Fgfr1fl/fl;OC-Cre mice. (A-B) TRAP staining and osteoclast quantification of tibiae from LPS treated mice and un-treated mice. Osteoclast number in Fgfr1fl/fl;OC-Cre mice was fewer than that in Fgfr1fl/fl mice before LPS treatment (0h). Both of osteoclast numbers were increased significantly after LPS treatment for 48h, however, there was no significant difference between osteoclast number in two types of mice after LPS treatment. (C) Serum TRAP5b analysis using ELISA method at different time points after LPS treatment. Serum TRAP5b in Fgfr1fl/fl mice was higher than that in Fgfr1fl/fl;OC-Cre mice before LPS injection (0h). Serum TRAP5b were both increased in Fgfr1fl/fl and Fgfr1fl/fl;OC-Cre mice after LPS injection, but there were no remarkable differences between two groups at each time point. Graphs show mean value ± SD. (Student's t-test, *p <0.05). The level of SDF-1α is higher in serum and osteoblasts from Fgfr1fl/fl;OC-Cre mice after LPS treatment. (A) Serum SDF-1α level was significantly higher in LPS treated Fgfr1fl/fl;OC-Cre mice than Fgfr1fl/fl mice. (B-E) SDF-1α mRNA level in osteoblasts and protein level in supernatant after osteoblast treated by 1ng/ml and 10ng/ml LPS. The SDF-1α levels of Fgfr1fl/fl;OC-Cre osteoblasts were significantly higher than those in Fgfr1fl/fl osteoblasts at all time points after LPS treatment. Graphs show mean value ± SD. (Student's t-test, *p <0.05, **p <0.01). Previous study demonstrated that SDF-1α was deposited in the bone matrix after being secreted by osteoblasts (34), and regulating the production of SDF-1α might mediate stem cell mobilization (12). We first measured SDF-1α mRNA expression in primary osteoblasts of Fgfr1fl/fl and Fgfr1fl/fl;OC-Cre mice before and after LPS treatment. Before LPS treatment, there was no significant difference between the SDF-1α mRNA level in Fgfr1fl/fl and Fgfr1fl/fl;OC-Cre osteoblasts. After LPS treatment (1ng/ml and 10ng/ml, respectively), SDF-1α mRNA levels in Fgfr1fl/fl;OC-Cre osteoblasts were significantly increased compared with that in Fgfr1fl/fl osteoblasts at 12h, 24h, 48h and 72h (Fig. 3B and D). In addition to measuring SDF-1α mRNA level, we also detected the SDF-1α protein level in osteoblast culture medium. Before LPS treatment, there was also no significant difference between SDF-1α levels in culture supernatant of Fgfr1fl/fl and Fgfr1fl/fl;OC-Cre mice. After LPS treatment, SDF-1α secreted from Fgfr1fl/fl and Fgfr1fl/fl;OC-Cre osteoblasts were both increased remarkably at all-time points measured. 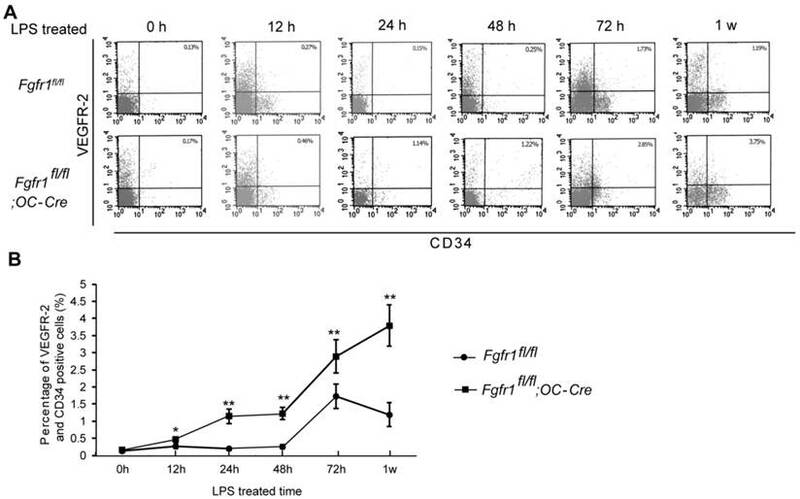 The SDF-1α levels in culture supernatant of Fgfr1fl/fl;OC-Cre osteoblasts were still higher than that in Fgfr1fl/fl osteoblasts, and the SDF-1α level was positively correlated with the LPS concentration (Fig. 3C and E). SDF-1α is a strong chemoattractant for a variety of stem/progenitor cells. Our data showed an increased percentage of EPCs and SDF-1α level in peripheral blood of septic Fgfr1fl/fl;OC-Cre mice, suggesting the role of SDF-1α in EPC migration. To confirm the effect of SDF-1 on EPC migration, we measured the chemotaxis activity of SDF-1α for EPCs by using a modified Boyden chamber (26). First, cultured EPCs were identified using flow cytometry, and double staining with Dil-LDL and FITC-lectin. Flow cytometry analysis of cultured EPCs showed that about 82.5% of cells were EPCs (Fig. 4A). The double positive cells cultured in this experiment are also considered as EPCs (Fig. 4B, yellow, arrows). These results indicated that we cultured EPCs successfully. Using these cells, we found that SDF-1α stimulated the chemotaxis of EPCs in a dose-dependent manner. The number of EPCs that migrated into upper chamber containing 1ng/ml, 10ng/ml or 100ng/ml SDF-1α for 4h was significantly increased compared with that migrated into lower chamber lacking SDF-1α ( Fig. 4C and D). SDF-1α promotes EPC migration. (A-B) Identification of EPCs. Flow cytometry was used to analyze cultured EPCs from bone marrow, and about 82.5% of cells were EPCs (A). Characteristic spindle-shaped EPCs (left panel) was also identified by double labeling using FITC-lectin binding (green) and Dil-LDL uptake (red). Double positive cells were identified as EPCs (yellow). (C-D) Directed migration of EPC responsing to SDF-1α was performed using a modified Boyden chamber. Migrated EPCs were stained using H&E staining. SDF-1α promoted the number of migrated EPCs. Stimulation with different concentrations of SDF-1α (1, 10 and 100 ng/ml) showed a modest but significant EPC migration. Higher SDF-1α concentration led to higher migrated EPC numbers. Graphs show mean value ± SD. (Student's t-test, a, p <0.05; b, p <0.05; c, p <0.001.). EPCs can differentiate into endothelial cells, and has been demonstrated to play an indispensable role in vascular maintenance and repair. Studies of patients with sepsis or acute lung injury revealed an improved survival accompanied with an elevated number of EPCs in peripheral blood (6, 7, 36). Our study showed that Fgfr1fl/fl;OC-Cre mice had a higher number of circulating EPCs than that in Fgfr1fl/fl mice after LPS injection. We also found that septic Fgfr1fl/fl;OC-Cre mice had longer survival time than septic Fgfr1fl/fl mice (Supplementary Material: Fig. S3), which suggested that the increased circulating EPC number in septic Fgfr1fl/fl;OC-Cre mice may be an important reason for the prolonged survival time. Increased EPC numbers in peripheral blood may be caused by the enhanced mobilization of EPC into blood. As a strong chemoattractant for stem/progenitor cells, SDF-1α plays an essential role in the regulation of stem/progenitor cells migration (14, 32, 33, 37). Our study demonstrated that SDF-1α exhibited a chemotactic activity for EPC migration in a dose-dependent manner in vitro. Another study using EPCs from human peripheral blood also indicated the role of SDF-1 in inducing EPC migration (38). SDF-1α belongs to the C-X-C chemokine family and can be secreted by osteoblasts (33, 39). Our result showed that there was significantly increased serum SDF-1α level in Fgfr1fl/fl;OC-Cre mice compared with that in Fgfr1fl/fl mice after LPS injection. Together with the significantly increased EPC number in Fgfr1fl/fl;OC-Cre mice, we proposed that the increased concentration of SDF-1α in blood may be the main reason for the increased EPC number in Fgfr1fl/fl;OC-Cre mice. We further found that SDF-1α level in primary Fgfr1fl/fl;OC-Cre osteoblasts was higher than that in primary Fgfr1fl/fl osteoblasts after LPS treatment. In bone tissues, we further found that SDF-1α mRNA expression in Fgfr1fl/fl;OC-Cre mice was also enhanced compared with that in Fgfr1fl/fl mice (data not shown). Nakayama et al. reported FGF2 could posttranscriptionally regulate the SDF-1α mRNA expression via FGFR1Ⅲc, an isoform of FGFR1 responsible for most of the biological functions (40-42). So we proposed that the significantly increased blood SDF-1α level in Fgfr1fl/fl;OC-Cre mice may result from increased secretion of SDF-1α from Fgfr1fl/fl;OC-Cre osteoblasts. A previous study showed that mice with osteoblast-specific knockout of BMPR1a have increased bone mass, number of osteoblasts and HSCs, and it was proposed that osteoblasts could support the formation of HSCs (10). Fgfr1fl/fl;OC-Cre mice have increased bone mass and osteoblast number. Increased levels of SDF-1 in Fgfr1fl/fl;OC-Cre mice may be related to increased osteoblast number because more osteoblasts could produce more SDF-1, which may support the formation of EPCs. In our study, cultured EPCs can migrate towards SDF-1, which is consistent with previous studies (38, 43, 44). We found that serum level of SDF-1 was higher than bone marrow in Fgfr1fl/fl;OC-Cre mice (Supplementary Material: Fig. S2), which will make a SDF-1 gradient between serum and bone marrow, leading to migration of EPCs from bone marrow to peripheral blood. Previous studies also indicated that activated osteoclasts might enhance migration of stem/ progenitor cells (17). In this study, there was no comparable osteoclast activity between Fgfr1fl/fl and Fgfr1fl/fl;OC-Cre mice after LPS injection, which suggested that the different numbers of circulating EPCs in septic Fgfr1fl/fl and Fgfr1fl/fl;OC-Cre mice may be not related to the changes of osteoclast activity. In summary, we showed that mice with osteoblast-specific deletion of Fgfr1 exhibited an increased mobilization of EPCs into peripheral blood undergoing endotoximia. The up-regulated expression of SDF-1α may be the main reason. Our findings also suggested that osteoblasts could have effect on mobilization of EPCs, which may benefit for the prognosis of endotoxemia. ECs, endothelial cells; EPCs, endothelial progenitor cells; FGFR1, fibroblast growth factor receptor 1; HSC, haemopoietic stem cells; PBMCs, peripheral blood mononuclear cells; SDF-1, stromal cell-derived factor-1; TRAP, tartrate-resistant acid phosphatase; VEGFR2, vascular endothelial growth factor receptor 2. The study was supported by Special Funds for Major State Basic Research Program of China (973 program) (No.2014CB942904), National Natural Science Foundation of China (No.81170809, No. 81471092), Fundation of army (CWS11J322). Corresponding author: Lin Chen, Department of Rehabilitation Medicine, Center of Bone Metabolism and Repair, State Key Laboratory of Trauma, Burns and Combined Injury, Trauma Center, Research Institute of Surgery, Daping Hospital, Third Military Medical University, Chongqing 400042, China. Tel: 86-23-68702991; Fax: 86-23-68702991; E-mail: linchen70com.